Looking for unique Christmas gifts for Dad? Dads can be hard to shop for – here’s a guide to 20 Christmas gifts for Dad that he’s sure to enjoy! Transform Dad’s iPod into a wide-screen virtual theater for on-the-go entertainment! Perfect for long flights and train/bus commutes. For the true sports lover! Decorate the fireplace with a fireplace screen embellished with the logo of his favorite sports team. Dad will sleep soundly with the amazing Tranquil Moments sleep sound machine. Gently lull Dad to sleep with exclusive technology – backed by 23 years of research! Sizzlin’ Grill Master BBQ Utensil Set gives the outdoor chef a hand and all the credit! 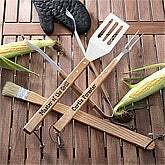 Set of 4 personalized BBQ tools is the ideal Christmas gift for the grill-meister. Dad can kick back and relax in his favorite sports team slipper! Available in most major team logos. 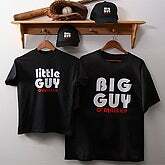 Matching personalized father-child t-shirts are wonderful Christmas gifts for Dad and the kids. Choose from several styles of fun, matching father-child t-shirts and take advantage of those Dad-worshipping years while they last! Everything Dad needs to enjoy the pre-game festivities! Perfect Christmas gift for sports fans. Enjoy movies, TV shows, photos and music on this versatile player. Record shows directly from TV – ideal for long flights! A gift the entire family will enjoy year-round. Roast marshmallows, sing around the campfire, create family memories with an outdoor fire pit! 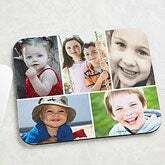 Create an amazing work of art from 5 of your favorite photos with a photo montage personalized mousepad. Priced at under $15, so why not order one for home and for the office? This karting voucher allows one child and one adult to enter a karting race day together as a team. Available in select cities nation-wide. Perfect for viewing his favorite professional game, or zooming in on wildlife! Brew premium beers right in your own home. Perfect for the beer connoiseur in your life! Style meets performance in this trendsetting model. A reasonably-priced camera that is sure to satisfy! Knead away stress with a shiatsu massage cushion! Small enough to take to the office or on trips. Get the whole family playing together with a reasonably-priced, high-quality foosball table! 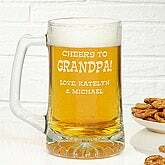 Beer just tastes better when it’s from a personalized beer mug! Terrific gift for any Dad who deserves a little rest and relaxation in style. Show his team pride with a personalized team jersey – available for most major league sports teams. Put his name and number on an officially-licensed sports team jersey! This year, give Dad a day out with his favorite team. Stubhub.com has tickets available for his favorite sports event or concert – even sold-out events! 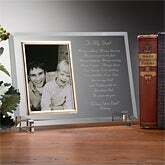 Be sure to check out all the great Christmas gifts for Dad at Men’s Best Gifts today!